Cinnamomum zeylanicum / SD-O / Sri Lanka leaves Certified Organics: This Organic Oil is NOP Certified. The National Organic Program develops, implements, and administers national production, handling, and labeling standards for organic agricultural products. The QAI also accredits the certifying agents (foreign and domestic) who inspect organic production and handling operations to certify that they meet USDA standards. Botanical Name: Cinnamomum zeylanicum Main Constituents: Eugenol: 77.15% Plant Part: Leaves Origin: Sri Lanka Processing Method: Steam Distilled Description / Color / Consistency: A brownish yellow to dark liquid with a medium consistency. Aromatic Summary / Note / Strength of Aroma: A middle note of medium aroma, it has a warm, spicy scent between that of clove and cinnamon, but with herbaceous notes that are not sweet. Customers seeking the smell of the cinnamon spice should purchase Cinnamon Bark. Blends With: Clove Bud, Lavender, Cedarwood, Orange, Lemon, Neroli, Ylang-ylang, Rosemary and Thyme. 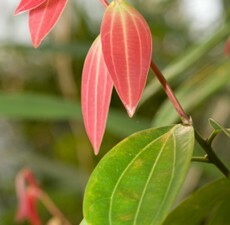 Product Abstract: Cinnamomum zeylanicum originates from Sri Lanka. It is a tropical evergreen tree of the laurel family growing up to 15 m (45 feet) in the wild. The tree has a very thin smooth bark, with a light yellowish brown color and a highly fragrant odor. Its pleasant scent has lead it to be a perfect addition to creams, lotions and soaps. Cautions: Dilute well before use; for external use only. May cause skin irritation in some individuals; a skin test is recommended prior to use. Contact with eyes and mucous membranes should be avoided. This has phototoxic properties and exposure to the sun must be avoided after application to the skin.